Aside from sludge treatment, deammonification resp. 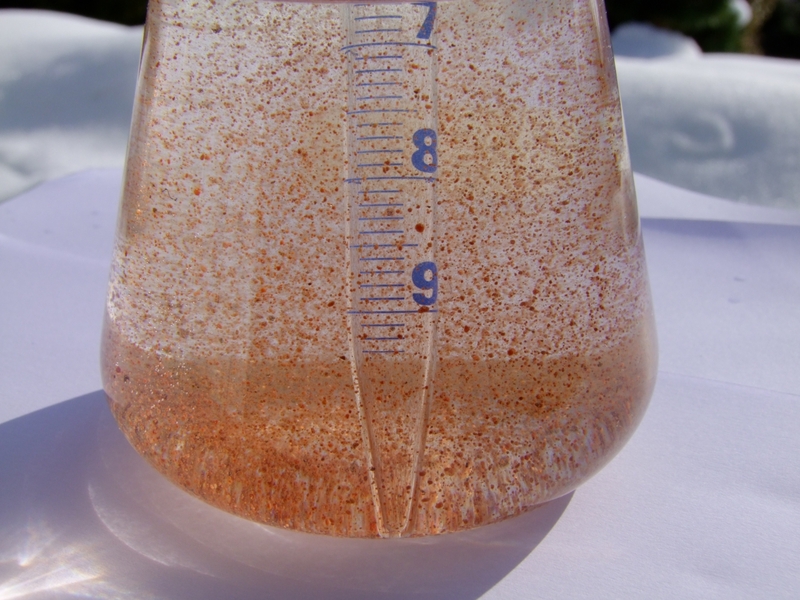 nitrogen removal is an important cost factor in wastewater treatment . The EssDe® process is a very efficient and cost effective solution for nitrogen removal. During anaerobic fermentation in the digester of a biogas or sewage plant, the nitrogen bound in the organics is released as ammonium nitrogen. The centrate of dewatered digested sludge is heavily contaminated with NH4-N. Treatment in the wastewater treatment plant without deammonification is cost-intensive and puts additional load onto the biological reactor basins. Conventional nitrification / denitrification converts ammonia to nitrite and then to nitrate using specialized bacteria. However, nitrate must then be denitrified again by adding an external carbon source. In 1997, we installed the first deammonification plants with separate treatment of process water (for example, Bern / CH, Glarnerland / CH) by utilizing denitrification if nitrite (denitrification). By avoiding the intermediary step to and from nitrate, 25% energy and 40% carbon (methanol) could be saved. 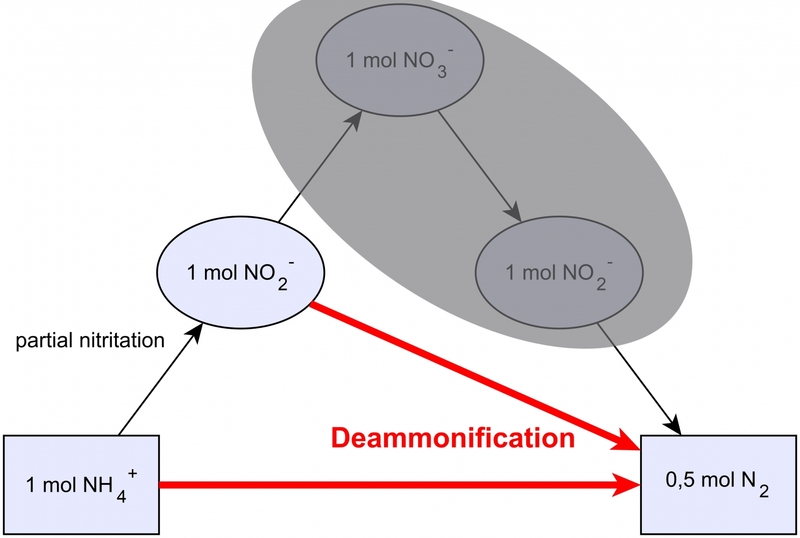 With the deammonification using the EssDe® process, only 50% of the ammonium is oxidized to nitrite. Subsequently, the produced nitrite is reduced to nitrogen gas along with the remaining ammonium. Compared to conventional nitrification / denitrification, this results in savings of around 60% in energy consumption. The consumption of external carbon, which is the main cost factor of the process water treatment, is reduced to zero. This process for eliminating ammonium from process water is carried out in an SBR or a continuously operated plant. 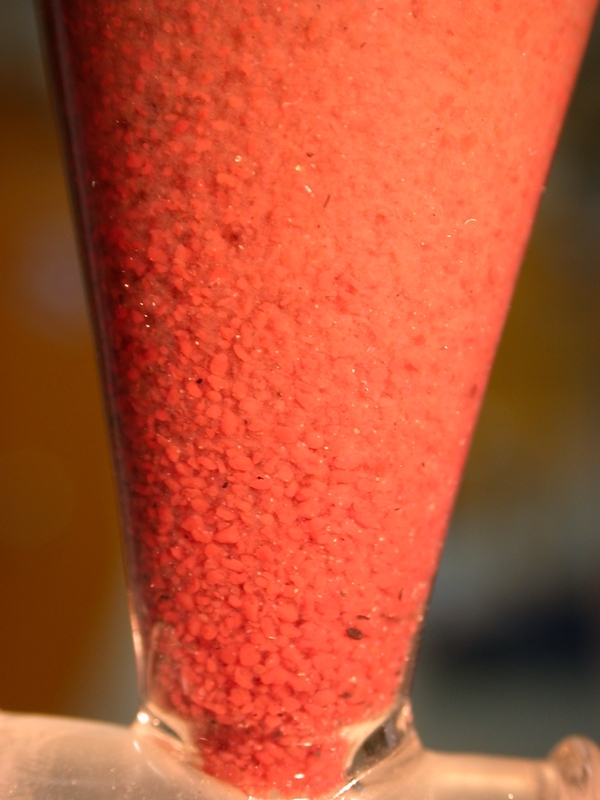 The intensive red color of the biological sludge is typical for the EssDe® process, the deammonification. The anaerobic bacteria form large granules in dense packing (1010 cells ml-1) which have good settling properties. The growth rate of this sludge is very low, which is why a high sludge age (SRT) is mandatory.